Chyawanprash (also spelled as chyavanaprasam) is an ayurvedic supplement fortified with various herbs, herbal extracts and minerals. It is very rich in Vitamin C content. It helps in the prevention of a variety of diseases through its immunomodulator effects and rejuvenation properties. Every living creature, especially human being wants to live a long life and wants to have a healthy body, mind and spirit. Human beings quest for a life full of vitality and positive energy since time immemorial. For the sake of this, human beings have discovered the ways to slow down the aging process and rejuvenating the body. Maharishi Chyawana formulated the Chyawanprash to rejuvenate his body. Now, Chyawanprash becomes an important dietary supplement and Ayurveda recommends it to all. Chyawanprash is an ayurvedic medicine and a dietary supplement prepared by ancient methods. It stands at the forefront of Rejuvenation supplements and therapies. Rejuvenation and revitalizing the body has become a very important step toward a healthy life in today’s hectic lifestyle. All people want to increase his capabilities and improve their life by some methods or supplements, which can help them to release out the toxins from the body and stress from the mind. Chyavanaprasam revitalizes and fulfills the nutritional needs of a person that may become insufficient due to bad eating habits and junk foods. Percentage Daily Value is based on a 2000 calories diet. These facts are analysed for chyawanprash containing 36% sugar content. Chyawanprash is herbal paste with the consistency of jam. It tastes sweet, sour and spicy. The major ingredients of chyvanprash are Indian gooseberry pulp, sugar syrup, honey, clarified butter (ghee), and sesame oil. Other ingredients include bamboo manna and more herbs listed below. Note: The Quantity described in the table is the quantity used to prepare 10 grams of chyawanprash. Some of the liquid content of Amla and other ingredients gets evaporated during the process of preparation. 10 grams of chyawanprash is prepared from following main ingredients. ** Sugar content may vary in different brands. Some add 3500 mg per 10 grams chyawanprash and some add the maximum amount as in the table. Some companies do not add sesame oil for maintaining the best taste of chyawanprash. Sugar content varies brand to brand and some companies do not add sesame oil, but in classical text Charaka Samita, sesame oil is a main ingredient of chyawanprash. Honey is also added when chyawanprash is cooled down. Chyawanprash is an Ayurvedic health tonic used to maintain health and improve the immune system of the body. It helps in fighting off the diseases and prevents the illnesses. Chyavanaprasam is an excellent ergogenic (enhancing physical performance) supplement. Chyavanaprasam provides strength to stomach, intestines, liver, lungs, brain, heart, blood vessels, nerves, kidneys and reproductive organs. Therefore, it is a complete health supplements, according to Maharishi Charaka. Chyawanprash is an anti aging supplement formulated from herbs that are antioxidants in action. It delays the aging of the cells and meliorates nutritional level in the body. It also improves the oxygen supply to the brain by strengthening the heart. Mainly, Indian gooseberry present in Chyavanaprasam is a powerful antioxidant and very rich in vitamin C.
Chyawanprash cleanses the alimentary tract and clears the digestive system. Small particles of waste products continue to deposit on the walls of intestine and colon, which results in toxin formation in the digestive system. Chyawanprash helps to reduce this accumulation of toxins in the intestines and clears the bowel. It has eccritic action, which means it promotes discharge or ejection of waste products from the body. It acts like as a laxative, which expel the stool from the bowel and promotes bowel movement. Therefore, it can also help patients suffering from constipation. Note: According to ayurveda, there is possibility of weakening of the intestine, which causes sluggishness of the bowel and lead to the development of chronic constipation. In such cases, eccritic medicines and laxatives should not be used. Therefore, if this is the case of your constipation, or you have used laxative medicines excessively, which makes your intestine weak, and then Chyawanprash cannot help. In such cases, medicines, which improve peristalsis, stimulate peristaltic movement, reduce gas formation in the intestines and strengthen intestines, should be used. 10 grams serving size of Chyawanprash contain 5.25 grams of Saponins, Phyto nutrients help to lower the cholesterol level. Saponins present in Chyavanaprasam blocks the absorption of cholesterol in the body. Bile acids play a role in binding the cholesterol in the body that helps in the absorption of cholesterol in the system. Saponins from Chyawanprash bind with bile salts and result in decreased absorption of the cholesterol. The body ultimately excretes the maximum amount of cholesterol entered in the digestive system. As we already discussed that Chyawanprash contains a good amount of Saponins, which also help reducing colon cancer risks. The mechanism is same as in lowering the cholesterol level given above. Saponnins bind the bile salts and may actually lower the risk of colon cancer. Some secondary bile salts increase the colon cancer risk, according to Linus Pauling Institute. The bacteria present in the gut produce these secondary bile acids from the primary bile salts released from the gall bladder and liver. Saponins present in Chyavanaprasam bind both types of bile acids, and thereby reduce the risk of cancer. Chyawanprash is very rich in Phyto nutrients and vitamin C. It improves the complexion of the skin. Daily intake of Chyawanprash decreases the risk of dry skin and provides a glowing and clearer skin. The main ingredient of Chyawanprash is Indian gooseberry, so it carries all the benefits that Indian gooseberry provides in the body. It prevents colds and allergies by strengthening the immune system of the body. Therefore, eating Chyavanaprasam daily helps to reduce the frequency of recurrent colds and upper respiratory diseases. 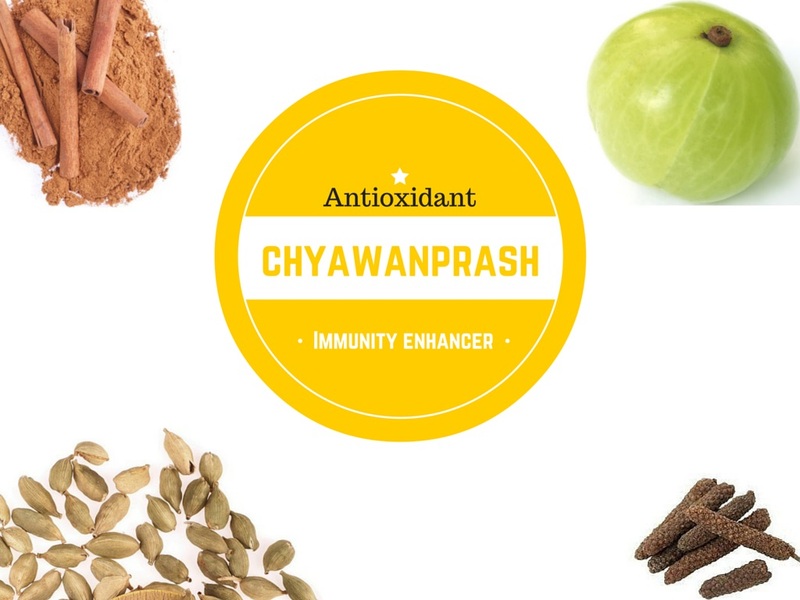 Flavonoids (plant pigments) present in the Chyawanprash prevent the overstimulation of the immune system and thereby prevents unwanted immune responses as well. However, it improves the immunity, but also prevents the immune system to activate unnecessarily. In the presence of flavonoids, mast cells, T cells and B cells work better and alter to the natural behavior of them, so it prevents inflammation and precludes allergies. It prevents excessive inflammation and improves the body strength towards external stimuli. Thereby Chyawanprash helps to treat allergies, asthma and upper respiratory diseases. Chyawanprash provides the strength to the heart muscles and improves the pumping capacity of the heart. It also controls the increased heartbeat. It also improves blood circulation in the body by which brain gets the optimum amount of the oxygen. Thereby, the mental capabilities boost up, so it is beneficial in ADHD, insomnia, memory loss, dementia, Alzheimer’s disease and other brain and neurological diseases. Chyawanprash does not only rejuvenate the body, but it also balances the three Dosha (Vata Dosha, Pitta Dosha & Kapha Dosha) in the body, according to the ancient Ayurvedic text. Therefore, it has been used since time immemorial for this purpose in Indian subcontinent. However, nowadays we use Chyawanprash as a health supplement, but it is actually a rejuvenative medicine. It means it repairs, helps regeneration and rejuvenates the cells and tissues. The loss of strength, decrease in restorative power of the body and reduction in immunity occur in chronic diseases. These powers can be achieved again with Chyawanprash. According to ayurveda, rejuvenative remedy should be started when medicines used for chronic diseases become ineffective. Chyawanprash is such rejuvenative medicine, which can help restoring health, reducing symptoms of chronic diseases, building immunity against external stimuli and triggers, improving other medicines’ actions and enhance medicine’s distribution and bioavailability. Chyawanprash promotes calcium absorption in the body that makes bones and teeth stronger. Although, it contains a minimal amount of proteins, it increases protein synthesis in the body. Thus, it improves muscle tone and muscle flexibility. It improves fertility and helps in loss of libido. It enhances fertility and helps in regulating the menstrual cycle in women. In pregnant women, it increases hemoglobin level and fulfills the requirement of other nutrients. It enhances immunity and boosts healing process. It prevents upper respiratory diseases such as common cold, allergies, upper respiratory infections etc. People, who are more prone to various common infections, can enhance their immunity using chyawanprash. Many diseases appear in a series of cycles. Sometimes, they appear and worsen the health and sometimes they subside. To break this cycle, Ayurveda recommends rejuvenation therapy. The chyawanprash is one of the best rejuvenation medicines that we can take for rejuvenation purposes. Therefore, chyawanprash is suitable for people who want to reduce the frequency of recurrence of various chronic diseases. Chyawanprash contains various herbs that work in asthma, so it can be considered a preventer ayurvedic medicine for asthmatic patients. It contains Indian gooseberry as a main ingredient, so it is also beneficial in heartburn and ulcers. It is also beneficial for pregnant women and growing children. It helps to improve the hemoglobin level in the pregnant women and provide better nutrition for a developing child. The dosage of Chyawanprash depends on the digestive capacity of the person. There is no specific dosage for Chyawanprash described in the ancient books. The actual dosage of Chyawanprash should be that a person could digest it without appetite loss and without a decrease in intake of other foods that he normally takes. Up to 12 Months Generally Not Recommended; Chyawanprash should not be used until an ayurvedic physician recommends. Instead, lactating mothers can eat Chyawanprash. It will provide benefits to the mother as well as to breastfeeding baby. Pregnancy 3.75 to 7.5 grams (a half to one teaspoon) – in most cases, a half tsp. (3.75 grams) of chyawanprash is sufficient dosage during pregnancy to get all nutritional as well as health benefits. The maximum dosage in pregnancy should not exceed 2 teaspoons (15 grams) a day (One teaspoon in the morning and one teaspoon in the evening). Note: Actually, 1 tsp. means taking up to the level of the edges of the spoon, not above. According to this principle, 1 teaspoon contains about 7.5 grams Chyawanprash. We have measured for US standard teaspoon. The US standard for 1 teaspoon is that it should contain about 4.9 ml water within it. You can eat chyawanprash with warm milk in the appropriate dosage according to your age. Goat’s milk and cow’s milk are most suitable adjuvants for it. Right Time to Take Chyawanprash On an empty stomach in the morning or before a meal; if taken twice, then one can also take it 30 minutes before dinner or 2 hours after dinner. How often should you take Chyawanprash in the day? 1 or 2 times; once a day is sufficient in most cases. Children should take it once a day. Adjuvant However, the specific adjuvant for taking chyawanprash is not described in Charaka Samhita. Generally, it is advised to take it with goat’s milk or cow’s milk. You can also take it with Almond milk if you don’t take dairy foods. You can also eat it without milk. Note: In some people, taking chyawanprash with milk cause gas formation in the abdomen. If it occurs to you, then you should eat it without milk and you can drink milk 30 minutes after taking it. If it is still not suitable for you, then you can alternatively eat it without any adjuvant, or you can take it with almond milk. Should I take Chyawanprash with milk or without milk? The Ayurvedic ancient text has not explained any adjuvant for taking Chyawanprash. They just recommend eating it on an empty stomach in the amount that you can digest easily. The correct method of taking Chyawanprash is eating it by licking without milk or any other adjuvant. If you want to drink milk, then it should be best if it is taken after half an hour. Amla is the main ingredient of Chyawanprash. Amla is believed to be an exception in wrong food combination that suggests milk is bad with sour foods. Most of individuals are taking it with milk. However, it can also be taken with milk. In some people, it can cause intestinal gas. If you are suffering from intestinal gas, or if taking chyawanprash with milk results in gas formation in the abdomen, then it is best to avoid eating it with milk. Will there be any harm if I take Chyawanprash with milk? Many people take Chyawanprash with milk without experiencing any side effects or harmful effects. In a few people, taking chyawanprash with milk can cause excess intestinal gas. What is the minimum age to start Chyawanprash in kids? You can start giving Chyawanprash to kids older than 1 year of age if recommended by an ayurvedic physician. Otherwise, it should be best to start after the age of 3. What type of Chyawanprash should be given to kids/children? Before buying, check the label of Chyawanprash for its ingredients. Purchase simple Chyawanprash, which does not contain Makardhwaj. Makardhwaj may not be suitable for children. Can I take chyawanprash during summer or hot weather? There is a misconception that chyawanprash produces heat in the body and should not be taken during hot weather. It is not true. The main ingredient of chyawanprash is Amla, which exerts cooling action. However, it also contains ingredients having hot potency, but overall it is a balanced formulation. These ingredients are not enough to reduce the cooling effect of Amla (Indian Gooseberry), but they might balance it. In fact, some of the ayurvedic texts recommend it in diseases resulting from Pitta increase in the body. These conditions include sunstroke, vertigo, nervine weakness, tachycardia, insomnia, anemia, etc. In fact, chyawanprash reduces the heating property of Pitta, but it might slightly increase the sour property of Pitta due to Amla. That is why some people misunderstood the concept. If a patient suffers from frequent urination, frequent loose stools or diarrhea, abdominal gas, bloating and dark yellowish urine, Chyawanprash should not be given. These include some Pitta conditions and some Vata conditions. Amla is also contraindicated in these diseases. If you are healthy and don’t suffer from any of these diseases, then you can absolutely take chyawanprash during summers. Can we use chyawanprash in pregnancy? What are its benefits if taken during pregnancy? These are two questions asked by many people. Yes, chyawanprash is SAFE and BENEFICIAL during Pregnancy. Ayurveda recommends using it for improving overall health of pregnant woman as well as developing fetus. It is beneficial in nutritional deficiencies and promoting blood formation, so it also helps to increase your hemoglobin levels. It provides following benefits to pregnant women. Vitamin C: Pregnant woman require at least 85 mg vitamin C (ascorbic acid) per day. The natural source of Vitamin C is considered best over unnatural supplement. In addition to other foods, it helps fulfilling minimum daily requirement of vitamin C in pregnant women. Vitamin C is also essential during pregnancy because it require for bone growth and preventing bone mineral losses. It is also a potent antioxidant and protects cells and tissues from damage. In developing fetus, chyawanprash helps a proper growth and development of cartilage, tendons, bones and skin. Vitamin C deficiency during pregnancy can lead to impair mental development in newborn babies, according to some research studies. Enhances Iron absorption & Helps in Anemia: Chyawanprash itself is a good natural and safer souse of Iron and vitamin C. Vitamin C helps the body to absorb Iron. Therefore, it also helps in the management of low hemoglobin level in the pregnant women. In addition to this, chyawanprash has haematinic property, which means it increases hemoglobin levels and hematogenic property by which it helps forming the red blood cells. Medical science also recommends using natural source of vitamin C than its supplements. All ingredients in chyawanprash are derived from the nature and are safer than unnatural Vitamin C supplement. Unnatural source of Vitamin C like Vitamin C tablets may not be safe because there are contradictory studies on this subject. Some studies have suggested that vitamin C supplementation may reduce premature rupture of the membranes and some have showed that it may increase the risk of preterm birth. These things are not observed with vitamin C gained through the natural sources like Amla, orange juice, lemon, grapefruit, strawberries, raspberries etc. What type of Chyawanprash can be taken during pregnancy? You should take simple Chyawanprash, which does not contain mineral or bhasma ingredients. Especially, your Chyawanprash should not contain Makardhwaj. Makardhwaj is contraindicated during pregnancy. Always check the label of Chyawanprash before consuming. General simple formulation of Chyawanprash will be best and you should not go for Special Chyawanprash preparations. When should I start taking Chyawanprash during pregnancy? There is no certain rule for starting or discontinuing Chyawanprash during pregnancy. You can take simple Chyawanprash throughout the pregnancy. Is it safe to eat Chyawanprash during pregnancy? According to ayurvedic concept, the simple formulation of Chyawanprash is likely safe to consume by pregnant women. There are no or minimal side effects reported with the use of Chyawanprash. A few side effects may appear in people who are more prone to indigestion, gas, abdominal bloating, loose stools and abdominal distention. The regular intake of Chyawanprash may increase these symptoms, but does not cause them itself. The most of these side effects come to notice when people eating Chyawanprash with milk. It may be due to the use of milk as an adjuvant. The many people who eat chyawanprash without any adjuvant, there is nothing wrong reported or observed. Highly Acidic Urine: If urine pH value indicates highly acidic urine, then Chyawanprash should not be taken. Symptoms of highly acidic urine are burning during urination and risk of uric acid stones in the kidneys. Chyawanprash is likely to worsen these conditions. Therefore, if you are suffering from any of these health problems, you should not eat Chyawanprash. People suffering from Diabetes should regularly monitor their blood sugar level if taking Chyawanprash because it contains sugar content. Parle M, Bansal N.Antiamnesic activity of an ayurvedic formulation chyawanprash in mice. Evid Based Complement Alternat Med. 2011;2011:898593. doi: 10.1093/ecam/neq021. Epub 2011 Jun 5. PubMed PMID: 21789046; PubMed Central PMCID: PMC3137779. Bansal N, Parle M.Beneficial effect of chyawanprash on cognitive function in aged mice. Pharm Biol. 2011 Jan;49(1):2-8. doi: 10.3109/13880209.2010.489904. Epub 2010 Aug 25. PubMed PMID: 20738179. Manjunatha S, Jaryal AK, Bijlani RL, Sachdeva U, Gupta SK.Effect of Chyawanprash and vitamin C on glucose tolerance and lipoprotein profile. Indian J Physiol Pharmacol. 2001 Jan;45(1):71-9. PubMed PMID: 11211574. The in-depth information, but I have doubt that you have written that chyawan prash should not be taken along with milk because it can cause bloating etc.But I am consuming it with milk since my childhood, I have not experience any such problem with this. The side effects are not due to the chyawanprash, but these may be due to the milk intolerance in some cases. But in some people, they also complaint some symptoms when they take chyawanprasha with milk and have no problem when they take separately. Second, amla has sour taste and ayurvedic principles are not in favor of consuming sour foods with milk. However, some people feel that amla is exception and can be taken with milk. Therefore, be on safer side, do not take chyawanprash with milk. does chyawanprash increase the gastric acid or cause gastritis? can we take chawanprash in gastric problems? chyawanprash does not increase acid in stomach. We didn’t get any complaint about gastritis due to chyawanprash. Yes, you can take chyawanprash in gastric problems. Its main ingredient is amla (indian gooseberry), it is highly beneficial in gastric problems. It can helps to rectify the gastric secretion and also beneficial in acidity, ulcer and heartburn. Can I give dabur chyawanprash to my grandfather. He is diabetic patient. Dabur Chyawanprakash sugar free can be given to diabetic patients. Just buy sugar free chyawanprash. i buy a chywanprash from local . but few days to continue in morning hour empty stomach . Then i fill my body so tempeture high , body thiling , cough , nose block . please suggest to me eat or not . These symptoms might be due to season change and it may not occur with chywanprash. You can continue eating chywanprash. If you have problem with eating on empty stomach, then you can take it at night before bedtime. How much ashwagandha is present in chyawanprash? 117.6 mg per 10 grams ashwagandha may present in chyawanprash if it is used as alternative of two ASHTAVARGA ingredients. Its amount can vary according to brand and formulas of various texts. Can chyawanprash protect kids from recurrent common cold, cough and fever or infections? Does chyawanprash increase the power of internal defense mechanism? My child is getting common cold frequently and he is 3 year old. Can I start giving him chyawanprasha? Taking sugar free Chyawanprash for diabetic patient clinically evaluated if so please what is the result. Can I give chyawanprash to my small baby of age 4 months? No, do not give chyawanprash to babies under age 6 months. I also do suggest that It will be good to start giving chyawanprash to babies only after one year. Give only breast milk for first six months exclusively, nothing else. Chyawanprash is effective to prevent common cold. I have experience with it since 5 years. I didn’t get cold a single time. I am eating chyawanprash 1 teaspoon two times a day with milk. Taking chyawanprash with milk is also safe for me. Can chyawanprash cure insomnia. How can I get rid of sleeplessness using chyawanprash? Yes, Chyawanorash can help treating sleeplessness. Its main ingredient is amla, which helps inducing sleep. Other ingredients also act as mental tonic. Other ayurvedic remedies for insomnia include mukta pisti, parwal pisthi, Jatamansi, tagar etc. Is it good and safe if diabetic patient take sugar free chyawanprash? Sugar free chyawanprash is just without sugar content and all other ingredients are same. It is equally safe and good for patients with diabetes, as it is beneficial in normal people. Sugar is bad for cancer. Is Chyawanprash good for cancer patient? When the Chyawanprash formulation initially developed, it does contain natural sugar, which is prepared using traditional/ancient techniques and with natural ingredients. But now manufacturing companies prepare it using industrial refine sugar. Absolutely, refine sugar may be bad for cancer. Now, refine sugar is prepared in the industries using some modern methods, which may be likely to cause the cancer. You should also know everything processed in the industries, packed and processed food is likely to bad for all and may responsible for cancer and other diseases, not only the sugar. However, Chyawanprash is still very useful for cancer patients for its rejuvenative and strengthening properties due to other ingredients. Yes, chyawanprash helps in preventing hair fall. You can also take Mulethi powder with milk to stop hair fall and grow more hairs on the scalp. Dinessh, you can eat chyawanprash to stop hair fall. It is an excellent ayurvedic supplement for hairs, bones, muscles, skin, and eyes. Does stool color change after taking chyawanprash? Generally, Chyawanprash does not cause any changes in stool, but if you are experiencing this problem, then stop using it for a few days. If you do not have such history of above diseases, then rule out the causes with your physician. Furthermore, some manufacturing companies add iron ash (Loha bhasma) in chyawanprash, read the label of Chyawanprash packing for LOHA BHASMA. If chyawanprash contains iron supplement, then you need not to worry. It will disappear after a few days. For more detail, please consult your physician. Is dabur chyawanprash organic? Do you know any company manufacturing organic chyawanprash using all organic ingredients? Dabur chyawanprash is not organic one. Organic India Pvt. Ltd uses organic ingredients in their Organic Chyawanprash. You can try this one. Yes, chyawanprash can help preventing frequent common cold and other upper respiratory diseases. The normal dosage of chyawanprash works fine. In adults, 2 tsp. of chyawanprash twice a day is considered better. Does chyawanprash cause weight gain? I put on 1 kg weight within a month after taking chyawanprash daily. Gaining 1 kg weight within a month might not due to chyawanprash. It’s normal even with small dietary changes. Chyawanprash corrects metabolism. It helps both types of people obese as well as lean or weak. It never influence weight gain or weight loss directly, but its action is always indirect. It helps improving body metabolism, which assists people to lose weight as well as gain weight, but you have to decrease or increase calorie intake according to your purpose. Hi… Wats the cost of chyawanprash?? Chyawanprash with Swarna bhasma (gold ash) cost around Rs 1000/- for 250 grams. Please give me reply i m waiting.. i am 23 years old can i take it.. Yes, you can take chyawanprash. It is good immunity booster and contains potent antioxidants. which one i can take.. dabar chtawanprash or any other..? Can I consume Chyawanprash while breastfeeding? Yes, Chyawanprash can be consumed while breastfeeding. It is considerably safe and healthy both for mother as well as feeding baby. which one is good for me..dabur chywanprash or any other..? please suggest me..
Zandu Chyawanprash would be best, according to my experience. I am suffering from hair fall can I take chyawanprash it help in hair re-grow and stop fall plz tell. Please tell me about more urination from taking Chavanprash. Is it possible in the girl 7 years old? Please tell me about possibility to cure Glaucoma. Is it possible with ayurveda? 1. Chavanprash contains Amla (Indian gooseberry) as a main ingredient. It has mild diuretic effects, but its diuretic effects are only for a few days. After that, it would not affect urination. Initially, child can experience more urination for a few days. Thereafter, urination will be normal and chyawanprash would not be responsible for more urination. Please also rule out other causes of excessive urination. If problem persists more than 15 days, please rule out by stopping chyawanprash. Some people might be sensitive than others for its diuretic effects. 2. We cannot say anything about curing Glaucoma with ayurveda because there are no scientific evidences are available regarding this. However, ayurveda has treatment for glaucoma, which might be effective for reducing some of symptoms. Following ayurvedic remedies help reducing glaucoma symptoms and preventing further nerve damage. Yes, chyawanprash can stop hair fall and help growing hairs. It has mild effect for growing hairs, but it would surely work for stopping hair fall. If dandruff is a main cause of hair fall, you might also need other remedies for it. Is chyawanprash safe during pregnancy? According to ayurvedic texts, Chyawanprash is safe in pregnancy. It is also used for nourishment and maintaining strength during pregnancy. It is also best for anemia in pregnancy. However, we do not recommend using chyawanprash fortified with minerals and Bhasma. Bhasmas have a potent action in the body and can influence hormonal levels. Hello, I’m suffering from constipation and acidity problems. Can I consume chyawanprash. If so, then which one do you suggest me? Chyawanprash can help in reducing constipation and acidity. It also improves digestion and facilitates proper liver functions to produce bile, which ultimately helps in constipation. You can buy chyawanprash of any good manufacturer. All have almost same ingredients. You can use chyawanprash prepared by following companies. Will chavanaprash make me fat ?? Chyawanaprasam contains minimal amount of fats. However, sugar content in chyawanprash is about 50%, so you should consider sugar intake. What is the best time to eat chyawanprash? The best time to eat chyawanprash is morning before sunrise. You should eat chyawanprash on empty stomach for getting its maximum health benefits. You may take both supplements together. There would be no problem with this combination. Sir, can I use chyavanprash ashtavarg for increase my appetite. I am suffering anorexia my weight is 49kg I need increase my weight is it helpful for me. Chyawanprash Ashtavarga is a general tonic. It may not increase body weight directly. It will correct digestive system and improves appetite. For increasing weight, you also need other remedy like Ashwagandha powder and black pepper. Black pepper will help digesting Ashwagandha and improves appetite. I am 20 years old and since last four years, my body weight is not increased. All medical reports are normal.. I was preparing for entrance exams, so I was eating less food because excess diet causes sleepiness. After that I have lost 4 kg weight from 46 to 40. Sir, please advise me which chyawanprash is better and any remedy with this. I am also feeling weakness in the body. You can eat Chyawanprash of any good manufacturer, her I am not able to recommend any brand name due to AYUR TIMES ethics. Ashwagandha is a good remedy for you for weakness and increasing weight. You can take it with warm milk twice a day. For more information about ashwagandha, you can read related article ashwagandha. Sir, I also have problem of hair fall and dandruff. Regular intake of Chyawanprash would help in these conditions. Is chyawanaprasam good for Pregnant women? Chyawanprash can help increasing Hb level and improves overall health of pregnant woman. Is Chyawanprash good for gout patient? Yes, chyawanprash can help gout patients with symptoms of tenderness, warmth and heat sensation in the joints. It also helps people with heel pain and toe pain due to raised uric acid. It works as supplement, so patient may require chandraprabha vati, Punarnava powder or punarnavarishta etc. for a proper treatment. My daughter is 1 year old. In the month of April, she suffered from pneumonia. Now she is fine. The thing is she always suffers cold, so I just want to improve her immune system. Can I give her chyawanprash? One more thing, her one medicine is still on (MONTICOPE), so please advise me. Chyawanprash is just a supplement that can improve the immune system. However, you may require other remedies such as swarna, giloy satva and yashad (zinc) supplement for recurrent cold and flu. In the market, chyawanprash fortified with gold is available, which would be better. I am very thin. Does chyawanprash help me to gain my weight? Chyawanprash will not influence body weight, but it will improve metabolism, so it indirectly helps in both cases – losing weight or gaining weight. You may also require Ashwagandha remedy for gaining weight. Is chyawanprash good for lymphedema? Actually, chyawanprash is a Rasayana (rejuvenative) Medicine in ayurveda. It means it helps in every type of disease and it is beneficial for every organ in the body. Chyawanprash is good for lymphedema as a nutritional and restorative supplement. If lymphedema occurred due to infections, then the chyawanprash is likely to work effectively because of its immunomodulatory and antimicrobial characteristics. But you should remember it is not a perfect remedy for the lymphedema. Lymphedema can have several underlying causes, so you may also require other remedies to cure the underlying causes of lymphedema. Does divya chyawanprash contain same ingredients, which you have listed here? Will it give same benefits if I use it? It is easily available near our home. Divya Chyawanprash contains almost same ingredients and Divya Pharmacy or any other company cannot alter the main ingredients. It will provide same health benefits as brands of chyawanprash provide. I have Dabur chyawanprash with me. Is it the best one to take as compare to other brands? Kindly suggest good brand. Hi. I started having chyawanprash a few days ago and my intestine seem irritated, with mucus and constipation. Could that be the cause? Or something I ate? Thank you. Mucus in stools with constipation commonly indicates poor digestion or malabsorption. All other causes for this are uncommon. In most case, the malabsorption is the main cause. You should also rule out other causes for it. Excess mucus in stools also indicates about inflammation in intestines due to any other underlying cause. Usually, we have not seen any such problem with Chyawanprash. Sometimes, people with poor digestive capacity may not digest chyawanprash properly. This might be the cause, but it is rarest one. In such case, you should stop using chyawanprash for several days and start it in lowest dosage (1/4 tsp. once a day) again when you feel normal. The dosage can be increased over several weeks so body can adjust with this supplement. Yes, Chaywanprash is indeed very good for the winter season. And now we have option for summer season also i.e. Patanjali Amrit Rasayan an equivalent to chywanprash but for the summer season to increase your strength, vigour & mental fitness. Can anxiety patient take chyawanprash? I have anxiety problem, so can I take it? Chyawanprash contains some herbs, which are anti-stress and anti-anxiety. These herbs nourish the nerve cells and acts as brain tonic. The calming effects of chyawanprash help reducing stress and anxiety. Chyawanprash fortified with Abhrak Bhasma and Mukta Pishti is more beneficial in anxiety and stress disorders. One can buy Chyawanprash, which contains minerals or otherwise himself add these two ingredients. Can I take Patanjali chyawanprash and Patanjali Amrit Rasayan both? I am taking 2 teaspoons morning and 2 teaspoon evening of Patanjali Amrit Rasayan. I have a chronic sinus issues so today I bought Patanjali chyawanprash. Can I start 2 teaspoons morning and 2 teaspoons evening of chyawanprash IN ADDITION to the existing dose of Amrit Rasayan? The ingredients of both seem to be different. Secondly, for how many months must one take Amrit Rasayan or Chyawanprash to see tangible benefits? 1. Yes, there should be no problem taking chyawanprash and Patanjali Amrit Rasayan together. 2. There is no specified dosage of chyawanprash in ancient texts. One can take chyawanprash in quantity that he can digest easily. Therefore, there should be no problem taking 2 teaspoons of chyawanprash with Amrit Rasayan. 3. Chyawanprash is health supplement, so it can be used for lifelong. For best results, one should take it at least for 6 months regularly. I am 40 years old and since the past one-week, I have been taking 1 tea-spoon of Patanjali Chyawanprash, daily in the afternoon (mixed in 2 sips of milk). However, since yesterday there is Pain in All my Joints (knees, elbows, ankles), while walking, sitting and lying. I have never experienced anything like this before. It seems I have suddenly developed Rheumatic Arthritis. I know, this might sound crazy, but it appears to me that the Patanjali Chyawanprash is causing all the joint-pains in my body, due to some kind of HEAT. Hope, it hasn’t boosted my Immune-System in the ‘wrong’ way! Dear Dr Jagdev, can you please share your valuable input, regarding my issue/concern bcoz all my Joints have suddenly starting hurting. Patanjali Chyawanprash is the only ‘new’ product, which I have started eating, since the past 7-8 days bcoz I am quite slim, slender and somewhat under-weight. Please let me know, if PC might have affected my ‘weak’ Immune System in such a way that it somehow imbalanced my VATA or PITA. Thank you. 1. We have observed a very few cases that had complained us about the joints pain after consuming chyawanprash. Almost all of them were having VATA dominant type body or Acidic body. Some of them also have history of gastric problems such as heartburn, burning sensation in the abdomen, acidity, sour taste in the mouth and history of joint pains on consumption of sour or cold foods. 2. People having pH value of blood toward acidic (when arterial pH falls below or equal to or nearby 7.35) may experience abdominal heaviness or joint pains after consumption of sour foods, AMLA or AMLA containing products including chyawanprash. 3. The second reason may be taking chyawanprash with milk. Sour food should not be taken with milk. However, AMLA is controversial food that may be taken with milk according to some scholars, but we strongly do not recommend taking Amla or Amla containing food with milk. Weak people (especially with acidic body) cannot tolerate Amla with milk, according to our clinical experience. In such cases, the beneficial effects of Amla containing product is also less. In such case, one should stop using chyawanprash and seek medical attention. Fenugreek seeds are best remedy in such cases. 500 mg Fenugreek seed powder should be taken 3 to 6 times a day with water. In severe cases, the Guggul preparation should be taken with milk to treat these types of joint pains. The best guggul remedy for this type of joint pains is Yograj Guggulu. Is it OK to switch from Patanjali to some other brand of Chyawanprash? Which brand in your opinion has the best formulation? My TSH tends to stay around the upper normal limit – sometimes a bit more and sometimes a bit less than the normal. Are you sure Chyawanprash does not lead to weight gain. Rightly or wrongly, it feels like that for the two months. I have been taking Amrit Rasayan and Chyawanprash morning and evening. 1. There should be no problem for changing manufacturing company or brand of chyawanprash. The ingredients are almost same with a little difference. 2. Personally, I always prefer the simple formulation of chyawanprash, which should only contain herbal ingredients. It is highly beneficial for long-term use. Brands or manufacturing companies do not matter much. Simple formulation according to Charaka Samhita matters a lot. 3. Chyawanprash is supplement, which may not directly affect TSH levels. It normalizes the functions of all tissues, glands and organs in the body. 4. Again, Chyawanprash is supplement, which is not intended to increase or lose weight. It just normalizes and restores the natural functions. 5. The daily dosage of chyawanprash contains less than 15 grams of sugar content. It means it has low glycemic index, which does not tend to affect insulin secretion and blood sugar level. Nowadays, glycemic index is used for food to measure if it causes weight gain or not. Thanks for the explanation. which one in your opinion is a simple formulation? would Dabur satisfy that? Dabur Chyawanprash is also good one. Since 10 days, I am giving half spoon of Dabur Chyawanprash to my son on daily morning before taking milk. He is 5 years old. I found that after started taking Chyawanprash, he is struggling during latrine and he is going for latrine 2 to 3 times per day. Is this any side effect from Chyawanprash? Please advice. Do not give chyawanprash before milk, with milk or after milk (Especially in case of children). There should be a 2 hours gap between chyawanprash and any milk product including milk, cheese and yogurt (curd). Dear Sir, Morning he will wake up between 6 to 6.30 AM and will brush the teeth. Then take chyawanprash and after 5 to 10 minutes gap. I am giving milk with HORLICKS. Then between 7.45 to 8 will have the breakfast of 2 idly and then move to school. In such schedule 2 hours gap, we cannot get. I’m more worried now. Please advise me. Skip giving chyawanprash in the morning and start giving it in the evening. There is no restriction on when to take chyawanprash. It will provide same benefits. Will you suggest this product for premature grey hair? Will it cure hair problems for men as nowadays boys are affected by this problem mostly? Mainly taking Amla is beneficial in premature graying of hair. Amla is a main ingredient of Chyawanprash, so it is suggestible for using it for preventing premature gray hair. You need not publish this if you don’t want (or maybe you should and let others read too). I just wanted to acknowledge your valuable insights via this forum. Most of the time people do not take Ayurveda seriously for lack of enough specific answers, which makes it look like less of a science and more of empirical wisdom. I find your answers to be quite specific. And the fact you have this forum can only paint a positive picture of you and Ayurveda. Also is there any evidence whatsoever that chyawanprash can further slow metabolism in individuals with already borderline TSH? Actually, I believe more in classical preparation written in Charaka Samhita for Chyawanprash, so I would like to recommend the second option eating only chyawanprash. There is no evidence available that suggest chyawanprash can slow down the metabolism in individuals with already borderline TSH. From your answers, it seems you favor the classic preparation of chyawanprash rather than any fancy variations. The standard preparation from Patanjali is out of stock. However, Patanjali also makes a special version of chyawanprash, which is more expensive. It has additional Kesar. Would you recommend taking this special version or switching brands to some other standard version of chyawanprash? In any case, what is your opinion of the added Kesar to the mix? What does Kesar do anyways? If Kesar is only the additional ingredient, then there should be no problem buying this product. Kesar is beneficial for improving non-specific immunity especially against several infections. Additionally, Kesar has several beneficial effects, which may not be listed here. We will add an update in detail regarding Kesar in next month. Hello sir, I have arthritis. Is it safe to take chyawanprash? Arthritic patients can eat Chyawanprash as supplement without any problem. There are articles on the net on chyawanprash that say not more than 25 grams a day should be taken. How this can be possible if one takes 2 teaspoons morning and 2 teaspoons evening as the container, (Patanjali) suggests. For me two spoons morning and 2 spoons evening means 1 KG container lasts 15 days, which means around 65 grams a day. I don’t feel any side effects, but is that much OK? How is about the sugar content in so much? Yet one should take enough to give benefits. How much do you suggest for adults without diabetes, but little hypertension and borderline TSH. Actually, 1 tsp. means taking up to the level of the edges of the spoons, not above. According to this principle, 1 teaspoon contains about 7.5 grams Chyawanprash (as we measured). The size of teaspoons can also vary according to the manufacturing company. The US standard for teaspoon is that it should contain about 4.9 ml water within it. We have measured according to this standard and found that up to the edges of the teaspoon, it contains about 7.5 grams Chyawanprash. As written in dosage section of this article – The actual dosage of chyawanprash is according to the capacity of the person that he should not lose appetite and decrease normal intake of the other foods. Therefore, there should be no problem if you can digest it up to 65 grams per day, as per ayurveda. Actually, sugar content is more important thing to care for. In ancient times, there was no chemically processed sugar, as we have today. As per American Heart Association (AHA), the maximum daily intake of added sugars should be less than 150 calories (37.5 grams sugar) per day for men and 100 calories (25 grams sugar) per day for women. You are taking 65 grams chyawanprash a day, which is likely to contain 22.75 to 35.75 grams sugar content. I don’t know how much sugar is added in Patanjali Chyawanprash, but we prepared chyawanprash for our personal use with 3.5 grams sugar content per 10 grams chyawanprash for which it should be 22.75 grams sugar per 65 grams chyawanprash. If you increase the dosage, then added sugars should be decreased in other foods to keep it under 37.5 grams sugar for men and 25 grams sugar for women. Patanjali has 67% sugar, which means I am taking about 44 grams of sugar only from chyawanprash. Clearly, this is too much because I take 1 spoon of sugar with my coffee and sometimes spoon of honey in the evening. If I cut my chyawanprash intake by half, will I still get the optimum benefits or will the amount be less than what is needed to do something significant. Yes, decreasing dosage of Chyawanprash will also give similar health benefits. In ayurveda, the dosage of Rasayana (supplement) does not have significant importance, the regularity in taking Rasayana is more important. There should be no problem taking Chyawanprash, but 3 hours gap between all allopathic medicines and chyawanprash is highly advisable for precautionary purposes. I suffer from frequent cold, mostly in winter. Am also prone to dust allergies. Regular use of chyawanprash gives me relief. Can I have chyawanprash during IVF procedure. There should be no problem taking chyawanprash during IVF procedure. For more information, consult your attending physician. Is Dabur a good mark for Chyawanprash? I live in France and this is the only one I can get here in Indian grocery shops. There should be no problem with Dabur Chyawanprash. It is also good one. you mention chyawanprash is now available for diabetecs also. can you confirm if what you are talking about is Dabur Chyawanprakash or something else? Please note it is called Chyawanprakash not Chyawanprash. Is it really same as Chyawanprash? Dabur Chyawanprakash Sugar Free has same ingredients as in Chyawanprash except sugar and honey. Does taking chyawanprash daily help us to grow faster and increase height? Chyawanprash is food supplement. It promotes optimum growth and development. Does chyawanprash prevent common cold and recurrent infections? Chyawanprash improves non-specific immunity against several virus, bacteria or microbes. The regular use of Chyawanprash reduces frequency of common cold and prevents recurrent infections. What is the dosage for 2.5yr child? Also he don’t like its taste. In what other ways can I include chyawanprash in his diet? Can I mix with water and make it dilute and give him as syrup? 2. Other ways to include Chyawanprash in Child’s Diet: Chyawanprash can be used as jam. It can be diluted/mixed in cow’s milk. If no measures are helpful, then it can also be diluted with water. Doctor, my husband recently bought Multani Chyawanprash from a chemist store. I’m 13 weeks pregnant today. Is this chyawanprash to take for me? I am not sure what ingredients are in Multani Chyawanprash. If it has heavy metal content like Makardhwaj, Ras Sindoor, Naga Bhasma or Chandrodaya, then it may not be suitable for pregnant women. The simple Chyawanprash without any Bhasma and Rasa Medicines is highly advisable for pregnant women. Hello, I have 3 questions. 1. Is it necessary to take food after taking Chyawanprash? 2. If necessary within how many hours, should I take food after eating Chyawanprash? 3. My last question is – maximum how many months or how many years will I take Chyawanprash? Chyvanprash is very good ayurvedic medicine for rejuvenation. Dabur makes something called Ratnaprakash. It may be sugar free like Dabur Chyawanprakash Sugar free, which is good for diabetics also because most chyawanprash formulations are high in sugar. Ratnaprakash seems to have something more than chyawanprakash like kesar but I don’t know about other ingredients. I wonder if you suggest if it is more advantageous to switch to the ratnaprakash formulation than Chyawanprakash. Which chyawanprash is better for chronic cough and weak memory and immune system and male fertility? Can i take chywanprash in early morning along with raw garlic. Does it reacts to the body when consumed. Dr Singh, how Chyavanprash can be so nutritious when it contains so much sugar? All fungi thrive on sugar. This is an ancient formula and as you said in ancient times, sugar wasn’t processed. Does this ancient recipe have the same nutritional value in our times, since sugar or honey are highly processed? The nutritional value of chyawanprash is attributed to Amla and other herbal ingredients. No doubt, it contains 35 to 50% sugar content, but it also contains natural nutrients and phyto-nutrients, which are also very important. Still we can consume 25 to 40 grams sugar per day. Single dosage (15 grams) of Chyawanprash is likely to contain maximum 7.5 grams sugar content, which is still normal thing. Herbs provide nutritional and therapeutic effects in the body, and still herbs are almost same as in ancient times, so it is still beneficial and having same clinical and therapeutic effects as mentioned in ancient texts. Instead of coffee, you can drink milk or take breakfast 30 to 60 minute after taking Chyawanprash. Does the sugar free chyawanprash contain any artificial sweeteners? Sugar free Dabur Chyawan Prakash contains sorbitol and sucralose sweeteners. Chyawanprash is taken in winter season. Is it also suitable for summers? Can we consume in summer season? Chyawanprash has balanced preparation and the main ingredient of Chyawanprash is Amla, which has cool potency, so you can also take it in summers. Regardless season, it can be used throughout the year. Can patient with hypothyroidism and diabetes take the Chyawanprash? Yes, if your blood glucose level is under good control, you can take it. However, if you uncontrolled diabetes mellitus, you should avoid it. Sugar free Chyawan Prakash by Dabur is also now available and it contains all ingredients of Chyawanprash in addition to sweeteners. Patient suffering from hypothyroidism can also eat Chyawanprash without any problem. Yes, heart patient can take Chyawanprash and it is rich in antioxidants and phytonutrients that have cardioprotective properties. I can digest milk due to weak digestive system, so cannot take Chyawanprash with milk. How can I take it for improving immunity? If your digestive fire is low, then you can start with dosage of 1/3 teaspoon of Chyawanprash. It should be taken on empty stomach in the morning without milk. Over a period of few weeks, increase the dosage of Chyawanprash to 1 teaspoon. Chyawanprash itself improves digestion and appetite, so your body slowly adapt with Chyawanprash and other foods too. You should not be in hurry to take its optimum dosage because you may also not digest it. Chyawanprash also works in low dosage when taken on regular basis. Is this product useful for weight gain? Dear Dr Jagdev Singh, I am considering taking Chyawanprash and noticed on 18 November 2014 you suggested the Krishan Gopal Aryuvedic Bhawan product, but you also suggested (on the 30 January 2015) the Zandu product, which one is best? Both are good. You can buy whichever is available to you. Can we combine Chyawanprash & Ashwagandha powder at same time in milk? Yes, both can be taken together. Which Chyawanprash is best to take. I just started to take it and some one recommend me Multani Rajbhogprash. Since there are so many brands available in the market like Patanjali, Dabur, Zandu, Baidhyanath, Himalya etc, so it’s really confusing which one is best. Your advise will be highly appreciated. However, we never recommend any brand, but this question is asked by many people, so we can tell what we use personally. We use Chyawanprash manufactured by Arya Vaidya Sala, Kottakkal. Its taste is little different and many children do not like its taste. Alternatively, one can use Chyawanprash manufactured by all common brands. There should be no problem. Ingredients in Chyawanprash are almost same. Thank You. I will definately follow your recommendation and will give a try to Arya Chyawanprash. Which preservative should we add in chyawanprash to increase its shelf life if we are producing it at large scale? Generally, a well-prepared Chyawanprash does not require any preservative. Since ancient times, no preservative is added and it is consumed within 6 months. I find chyawanprash consumption in summer months leads to body heat symptoms like big pimples under ears, forehead etc. These cease on stopping the use of chyawanprash. I want a substitute for summer months. Please do recommend. Patanjali Amrit Rasayan is widely known. I want your expert recommendations. You can try with Patanjali Amrit Rasayan. It is also a good ayurvedic supplement. You say in your article above that: “Chyawanprash does not only rejuvenate the body, but it also balances the three Dosha (Vata Dosha, Pitta Dosha & Kapha Dosha) in the body, according to the ancient Ayurvedic text. I have used several brands of Chyawanprash, and they are generally spicy and somewhat heating. My understanding is that it is very good in the Winter to prevent colds and respiratory problems–conditions which are Kapha. I am puzzled why you say that it balances Pitta? Others say that it may be better not to use it during the hot season. The Pitta-increasing effect may also be a reason why it is usually advised to take it with milk. 1. No, Chyawanprash actually balances three Dosha including Pitta. It applies to simple Chyawanprash that does not contain minerals. Spices added in Chyawanprash are not enough to reduce the effects of Amla (Indian Gooseberry), which is a main ingredient of Chyawanprash. Amla exerts cooling action and reduces heat in the body. 2. However, in some cases where an individual suffering from frequent urination, diarrhea or frequent loose stools, abdominal distension due to excess gas, and urinates dark yellowish urine, Chyawanprash should not be given. These include some Vata conditions and some Pitta conditions. Amla is also contraindicated in these conditions. 3. Chyawanprash actually reduces the heating property of Pitta, but it might slightly increase the sour property of Pitta due to Amla. That is why some people misunderstood the concept. However, these effects only appear in people suffering from any of above conditions as described in Para 2. 4. In ayurveda, Chyawanprash is recommended when people suffer from the excess heat. These conditions include sunstroke, vertigo, burning sensation, nervine weakness, tachycardia, insomnia, anemia, etc. Thank you for your reply. This is excellent information, and very timely for me since I am Pitta/Vata and we are going into the Summer season. Now I don’t have to be concerned about continuing to take Chyawanprash when the weather is hot. It is a great service you are doing by providing good reliable information on Ayurvedic medicines. Here’s wishing you all the best in your endeavours! My age is 44, My job is on computer but since last few yrs i am not able to work regularly. my Email is ameen44shk@gmail.com. please reply. I am facing few problems like got HYPO Thyriod. Also due to chiken gunya and due to uric acid got pain in joints. Also mentally depression and loss of immunity – weakness is frequent. Even got sinus due to which sometime has migraine and continuously watering eyes and itching. Please suggest me what i am suppose to do and i dont want to continue Allopathy medicine. Thanks for the information. I’m suffering from celiac disease should I take Chyawanprash or does it contain gluten? Chyawanprash does not contain gluten. I’m so skinny.. can you suggest me some medicine for that.. Is chavanaprasham good.. is there rules for consuming it..? Ashwagandhadi Lehyam should be the best remedy for this. Whenever I consume chyawanprash it causes cough, maybe because its sour. So, I want a recommendation on which one is good for me? I have heard from many about kottakkal, dhootpapeshwar swamala, and organic India. Which one would be the best option? Please do give your answer. It should not cause cough. In fact, it is also used to treat cough. You should also rule out other possible causes. However, the effects of each medicine may also be different person-to-person. You can try chyawanprash from Kottakkal. If still, you feel, it causes cough, then you should not take it.